Caption slip reads: "Photographer: Gaze. Date: for Mon. 1957-01-28. Reporter: Gaze. Assignment: Chas Siegfried 60th wed ann. 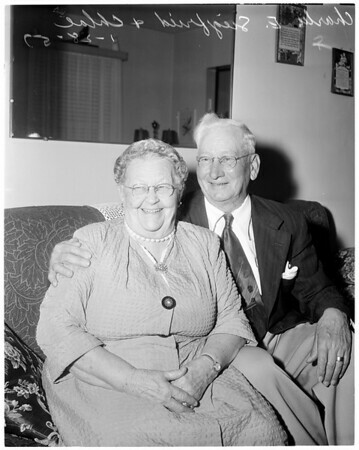 5/6/7/8/12/52/53/79/80: Charles E. Siegfried, 80, and his wife, Chloe, 78, who last night (Sun. Jan. 27) celebrated their 60th wedding anniversary. They have 8 children, 26 grandchildren, and 25 great-grandchildren. From the Charles Siegfrieds on down there never has been a death (of a blood relative) in the family".